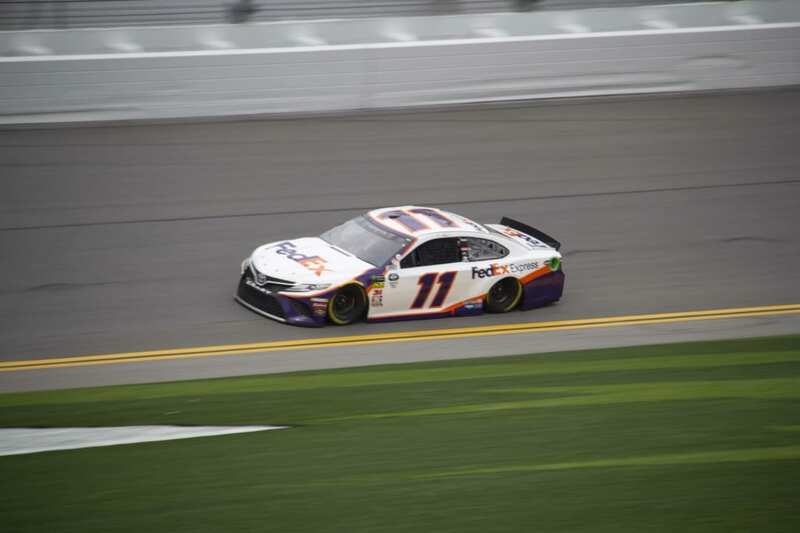 The 2019 Advance Auto Parts Clash opens racing for the Cup cars at Daytona. The green flag dropped shortly after 3:00 pm today. After only eight laps the yellow flag brought the action on the track to a crawl. One lap later the field entered pit road and the red flag was displayed. Paul Menard(21) started from the pole, which was earned in a blind draw. Kyle Busch(18) started opposite Menard and led the first lap. Menard hooked up with fellow Ford Mustang driver Brad Keselowski(2) and blew past Busch and led a Ford parade at the front of the field. Alex Bowman(88) sat 3rd, Monster Energy NASCAR Cup Series Champion Joey Logano ran 4th. The Fords of Ryan Blaney(12), Ryan Newman(6), were 5th and 6th. Followed by Martin Truex Jr.(78), Kurt Busch(1), Clint Bowyer’s(14) Mustang, and Kyle Busch(18). 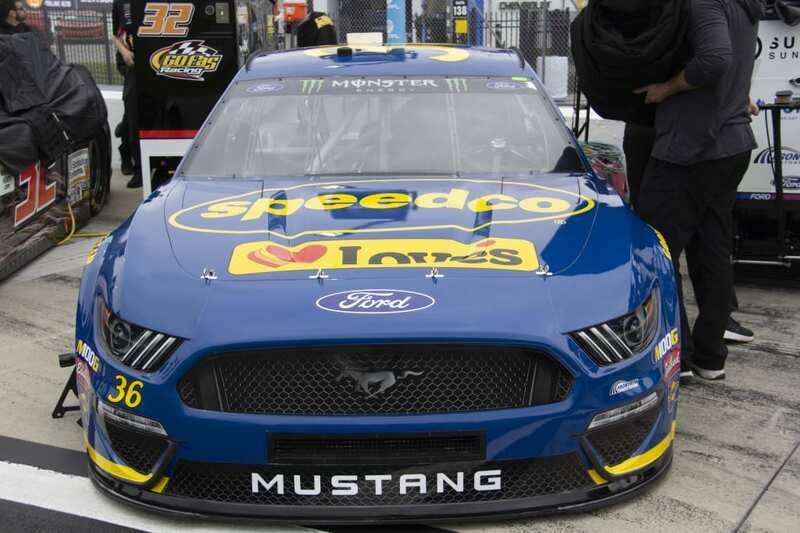 The nose of the new NASCAR Mustang is easy to differentiate from the other cars on the track. But, the tail of the pony is cool. 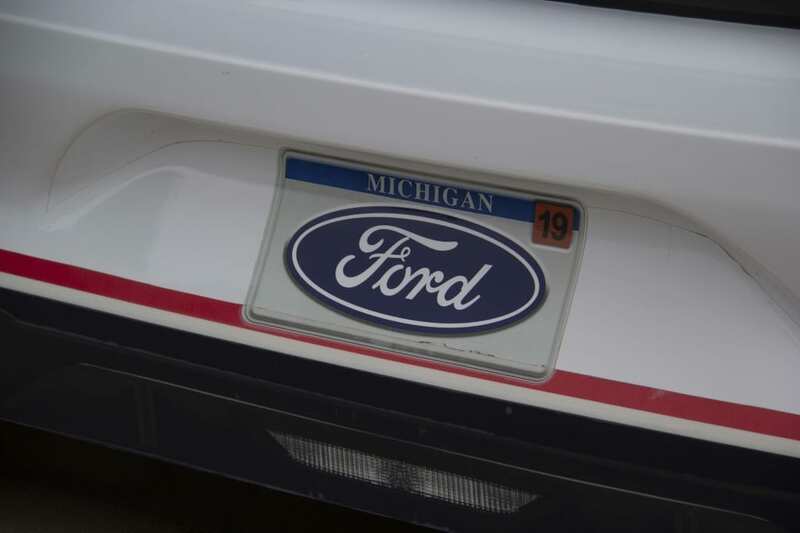 All the Mustangs are displaying a Michigan License Plate with the Blue Oval and at 19 tag sticker. A light rain dampened the Speedway an hour before the race. The Titan Air Dryers quickly dried the track. 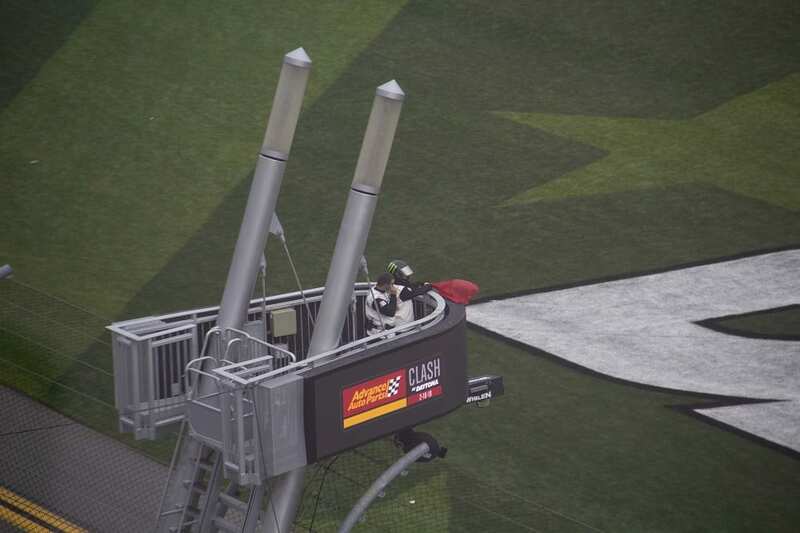 The red flag stoppage appears to be a similar situation as the precipitation lasted only a couple of minutes. After a 21-minute red flag stop cars returned to the track. With a bit of time out of the car, the Ford guys got together and formed a restart strategy. On the drop of the green, the Mustangs lined up and took off. Menard, Keselowski, Logano, Blaney, and Newman led the draft. A scheduled caution after lap 25 brought everyone to pit road. The stops shuffled the running order when the race restarted. Menard still led, Denny Hamlin(11) moved into 2nd, Keselowski 3rd, Jimmie Johnson(48) 4th, and Kyle Busch 5th. Just past the halfway point of the race moisture on the track again intervened. The caution flew again on Lap 40. Another light mist, not really a solid rain. 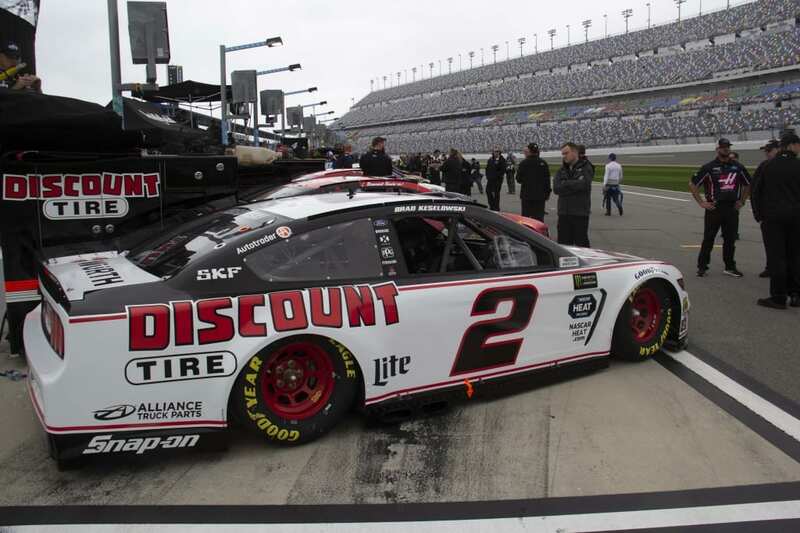 The cars remained on the track until the red came out on lap 43. The 2nd red flag lasted a mere 8 minute. Track crews are doing a great job of keeping heat in the track and Mother Nature has not drowned the facility yet. The top line is the fast lane around the speedway. Cars that get out of the draft, dropping to the low side, move quickly to the back of the pack. It takes a drafting partner to make a move high or low. There has not been a lot of side-by-side racing. Off course, there are only 20 cars on the track for this race. As the race prepares to go green on lap 47 crew chiefs are warning drivers an end of race rain event is imminent. Menard continues to lead as his Mustang is clearly the class of the field. The seven-time champion Jimmie Johnson runs 2nd. The Busch brothers Kurt(1) and Kyle sit 3rd and 4th. On Lap 55, Team Penske got lined up on the inside. With Logano leading the 3 car draft the trio started to make a move to the front. Down the backstretch, Johnson pulled out like he might drop down and block the lower line. He tapped the left rear quarter of Menard’s car and caused the Wood Brother’s machine to spin. The classic “big one” ensued. As predicted the rain returned, this time in earnest. The sky opened up and completed soaked the track. Once more the red flag came out. Only nine cars made it back to pit road with Johnson, Kurt Busch, and Logano sitting 1st thru 3rd. Having lost the race track NASCAR quickly moved to call the race. Johnson was declared the winner. Ironic, Johnson and longtime crew chief Chad Knaus were separated at the end of the 2018 season. Knaus and his new driver William Byron won the pole for the 500. Johnson and his crew chief Kevin Meendering won the Clash. Bodes well for Hendrick Motorsports this coming week? 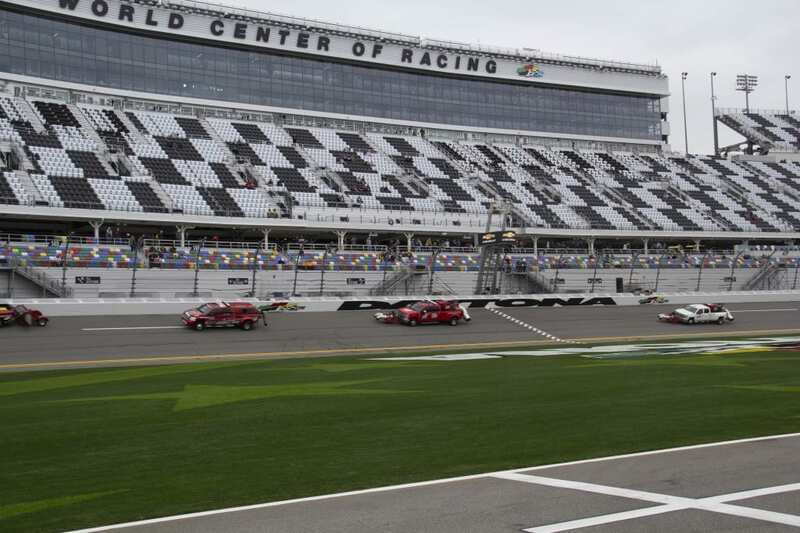 Cup cars back on the track Thursday for the Gander RV Duels at Daytona. Live coverage from Daytona, look to The Lasco Press.